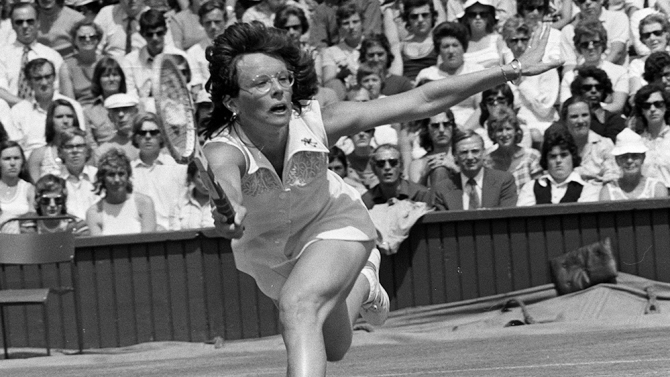 The United States Tennis Association (USTA) today announced the program to celebrate the 50th Anniversary of Billie Jean King’s 1967 triple crown where she won the women’s singles, women’s doubles (with Rosie Casals) and mixed doubles (with Owen Davidson) championships. King’s singles triumph was the first of four US Nationals/ US Open women’s singles titles in her Hall of Fame career, in which she amassed a total of 39 Grand Slam titles. Throughout her life, King has used her notoriety to promote equality in and out of sports through her unrelenting fight for equal prize money, as well as the formation of the Women's Tennis Association, the Women's Sports Foundation, World TeamTennis and most recently, the Billie Jean King Leadership Initiative. One of the most game-changing moments of King’s career was the famous “Battle of the Sexes” in which she defeated Bobby Riggs at the Houston Astrodome on September 20, 1973, which became the most watched televised sports event of all time. The upcoming feature film “Battle of the Sexes,” being released on September 22 by Fox Searchlight Pictures, tells Billie Jean King’s courageous story. Academy Award winner Emma Stone, who portrays King in the “Battle of the Sexes” film, said, "Billie Jean is an inspiration to all of us and l I was so lucky to play her in Battle of the Sexes. She changed history and continues to be one of the most powerful voices for equality today. What an honor it is to get to be here to celebrate her many achievements." In the pre-match ceremony in Arthur Ashe Stadium, at the tennis center that bears her name, King will be honored by Adams and Stone, who will be joined by noted singer/songwriter Sara Bareilles who will perform her hit song “Brave,” and has also composed an original song for the film, “If I Dare,” which will be released on September 15. Bareilles will also perform “America the Beautiful” and be joined by a Color Guard from the United States Marine Corp 6th Communications Battalion, Brooklyn, NY and cadets from the United States Military Academy at West Point, who will unfurl a giant flag across the Arthur Ashe Stadium court during the performance.